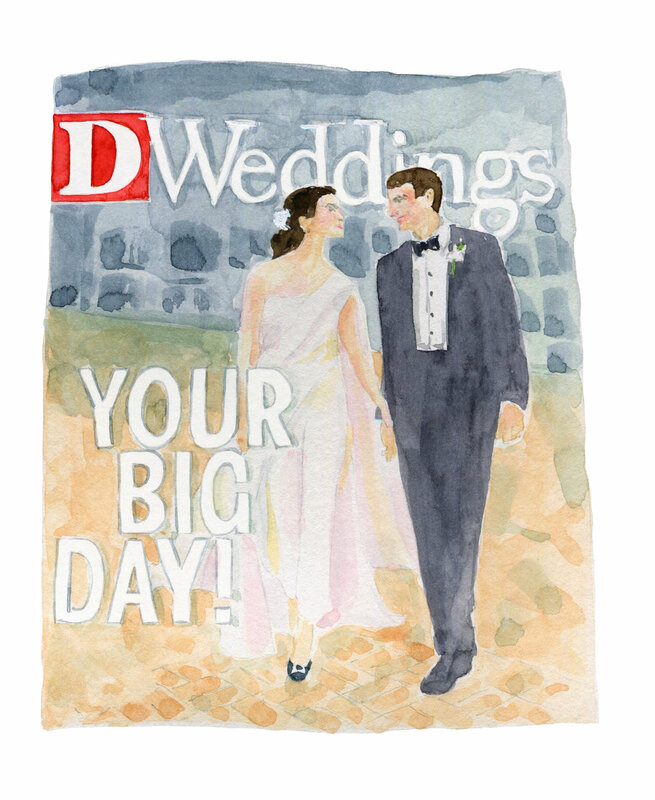 When Loddie Allison of D Weddings (D Magazine) emailed us about potentially doing the watercolor illustrations for the new D Weddings website I knew I had to drop everything (literally- we were moving homes across town at the time) and get started on brainstorming. D Magazine sent us a list of illustrations and a gallery of photos for inspiration to make sure we got the coloring and concept right. When I used to live in Dallas I would wait for the D Magazine best of Dallas Restaurants Magazine release. I had a friend who worked with D Magazine so we would go to their events sometimes - their magazine always 'wow-ed' me - how could they always be finding the newest coolest cutting edge things in our city. It was unreal- there was always a whole hidden culture somewhere in the city ready to seen, tasted, or explored.. I was constantly impressed. When I got engaged I even remember going to pick up all the magazines and D Weddings was on top. They always had the prettiest parties and ideas written up- from completely classic to the newest trend. Basically- we knew we had to do this project perfectly. See below the fun illustrations we came up with for them and where they used them on their website & instagram.